1. Compare against a known, well-recognized (potentially non-portable), implementation. As discussed in the previous section, performance portability can be an elusive topic to quantify and different engineers often provide different definitions or measurement techniques. Below we characterize a few well-defined approaches. Measuring 'portability' itself is somewhat more well defined. One can, in principle, measure the total lines of code used in common across different architectures vs. the amount of code intended for a single architecture via IFDEF pre-processing statements, separate routines and the like. A code with 0% architecture specific code being completely portable and a code with a 100% architecture specific code being essentially made up of multiple applications for each architecture. One subtlety that this approach hides is that it is possible that shared source-code requires more lines than source-code intended for a single architecture or, in some cases, even two sets of separate source-code intended for multiple architectures. We ignore this case for now, assuming that using a portable approach to express an algorithm doesn't significant change the amount of code required. 'Performance', even on a single architecture, is a bit less simple to define and measure. In practice, scientists generally care about the quality and quantity of scientific output they produce. This typically maps for them to relative performance concepts, such as how much faster can a particular run or set of runs finish today than yesterday or on this machine than that. The drawback of trying to measure performance in this way is that the baseline is arbitrary - i.e. you don't know how well your code is performing on any architecture compared to how it 'should' be performing if it were well optimized. One may attempt to define absolute performance as a measure of the actual floating point operations (or integer operations) per second (FLOPS) of an application during execution compared to the theoretical peak performance of the system or fraction of the system in use, as reported on the Top 500 list - Top500.org - or as reported in the system specs. The application or algorithm may be fundamentally limited by different aspects of the system on different HPC system. As an example, an implementation of an algorithm that is limited by memory bandwidth may be achieving the best performance it theoretically can on systems with different architectures but could be achieving widely varying percentage of peaks FLOPS on the different systems. Many performance tools exist at ALCF, NERSC and OLCF for the purposes of profiling applications or regions of applications and determining performance limiters when comparing different implementation of an algorithm or method. See the comprehensive list here with links to detailed instructions and example use-cases at each site. As discussed above, the major limitation of defining performance relative to the peak FLOPS capability of the machine is that applications in practice are limited by many different aspects of an HPC system. Here the blue line represents the maximum performance that can be achieved on a KNL node for an application running out of the KNL High-Bandwidth Memory (HBM) with a given DRAM-AI (the x-axis value). For low values of DRAM-AI, the performance is limited by the diagonal ceiling, meaning that memory-bandwidth is the limiting hardware feature. The location of the diagonal lines are typically computed empirically from the available bandwidth reported by, for example, stream triad like kernels. For high values of DRAM-AI, memory bandwidth no longer limits performance and one can, in principle, achieve the max compute performance on the system. However, for such cases we may draw other ceilings that represent common limitations in algorithms or implementations of algorithms. The dashed-dotted green line labeled "-ILP" is the performance ceiling for applications that: 1. do not provide a balance of multiply and add instructions, or simply don't use the Fused Multiply Add (FMA) instructions on the processor and 2. don't have enough instruction level parallelism to keep both VPUs on the KNL busy. The dashed purple line labeled "-Vectorization" is performance ceiling of an algorithm or implementation that, in addition to the above two deficiencies, lacks vectorization (a combined factor of 32 reduction in the ceiling). For applications that are limited by other system properties, it is possible to extend the roofline model to include related ceilings. For example, we commonly extend the roofline approach to use arithmetic-intensities based on data movement from different levels of cache (e.g. L1, L2 on the KNL), in order to discover the relevant limiting cache level. The figure below shows an example of such an extended roofline plot for an application limited by the L2 cache level. 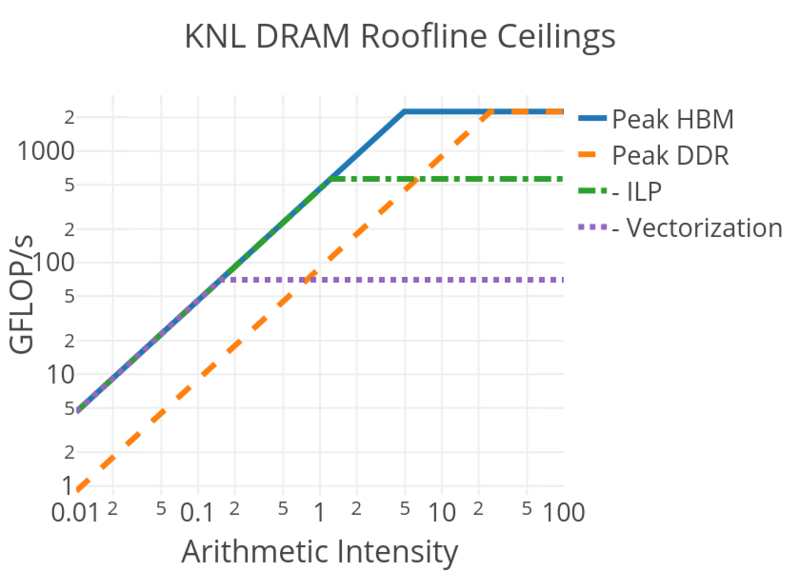 The value of the roofline approach is that the relative performance of an application kernel to relevant ceilings (those related to fundamental limitations in an algorithm that cannot be overcome via optimization) allow us to define an absolute performance ratio for each architecture in order to quantity absolute performance and performance portability that accurately reflects the different limiting hardware characteristics of each system. On the following pages, we discuss how to collect roofline data on both KNL and GPU powered nodes.